US building board demand will rise 7.0 percent yearly through 2017 to 52.5 billion square feet (3/8 inch basis). Windows and doors, subflooring, and roofing will be the fastest growing uses. OSB will outpace softwood plywood among structural boards. Insulation board and high and low density fiberboard will pace nonstructural boards. 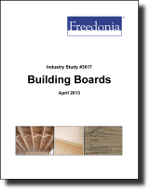 This study analyzes the 37.5 billion square foot US building board industry. It presents historical demand data for 2002, 2007 and 2012, and forecasts for 2017 and 2022 by product (e.g., oriented strand board, softwood plywood, particleboard, medium density fiberboard, hardwood plywood, hardboard, insulation board), market (residential and nonresidential construction, manufacturing), application (e.g., roofing, subflooring, wall sheathing, cabinets, siding, furniture, transportation equipment), and region. The study also considers market environment factors, details industry structure, evaluates company market share and profiles 27 industry players such as Georgia-Pacific, Louisiana-Pacific, and Weyerhaeuser.